More information has been released about tonight's controversial BBC documentary on the possible negative side-effects of intensive gaming. A Panorama investigation entitled ' Addicted to games?' tackles that question by speaking to a number of players, relatives and experts. Extracts from the programme, released to the Press Association, reveal that it will depict a Nottingham teenager claiming of Call of Duty that "I wouldn't move from my bed. My controller would be at my side table, I would turn it on, play, and then I would realise it was about three o'clock in the afternoon." Adrian Hon, COO of SixToStart, argues in the show that game designers should be more cautious around the inclusion of compulsive mechanics. "I think people don't necessarily understand how powerful some game mechanics can be. "It's one thing to think 'okay, I'm playing too much,' but it's another to just stop playing, because some games are designed in a manner that you just don't want to leave." Hon references 1950s experiments on rodents and operant conditioning, claiming that some games leverage this by offering many and varied rewards to players. "I think the industry needs to be thinking about this a lot more. Because games are becoming so much more widespread and because they're becoming so much more powerful." Hon expounds his theory further, and offers more qualification, in this Telegraph piece. Also contributing is Nottingham Trent University's Professor Mark Griffiths, who argues for more research in order to better ascertain whether addictive behaviour stems from the games themselves or only from certain players. "It's a neat little psychological trick and for most people this will not be something that's bad, but if you've got... that vulnerability or susceptibility to addiction that will keep you in the game probably far in excess of what the normal person would do." "The good news is that for the vast majority of people videogames is something that is very positive in their lives. But we have to take on board that there is a growing literature that suggests that for a small but significant minority, things like gaming can be potentially problematic." 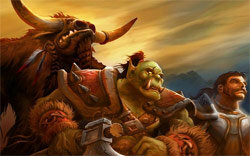 Being denied access to World of Warcraft turned a 19-year-old violent, claims Panorama. Last week, UKIE offered a pre-emptive denouncement of feared claims that games are broadly addictive. UKIE boss Michael Rawlinson is also due to appear in the Panorama investigation. TIGA has offered comment too, although admits to not yet seeing the show. Offered boss Richard Wilson, "There is a world of difference between people who claim, in the colloquial non medical sense, that they are addicted to games, music, football or a TV programme and people who are clinically addicted, in scientific parlance, to drugs or alcohol." "TIGA would welcome additional independent research in to this topic and takes this issue very seriously. As with all hobbies we advocate that video games are played in moderation, with gamers taking regular breaks. Parents and retailers should also ensure that children only play games that are age appropriate. 'Addicted to games?' happens to coincide with the launch of the latest World of Warcraft expansion - a game which is featured in the investigation. In a clip released from the show, 19-year-old Chris Dando claims that "It brought you into another world. You'd be what you wanted to be. It was like 'no, I've got to stay at home, I've got to do this." At one point, his mother cut off his internet connection due to fears that he was playing World of Warcraft for, the documentary claims, up to 20 hours a day. "The response was just an outpouring of violence. He just went beserk. "That was the point where we really started to understand, from a parental point of view, 'gosh, this is dangerous, this is a dangerous tool in our house.'" Adds the teenager, "I put on a boot and I kicked a hole in my sister's door. I smashed anything I could see." The clip does not question whether forcibly interrupting a teenage boy from other leisure pursuits might inspire a similar reaction. GamesIndustry.biz has seen an advance copy of the documentary and questioned its producer on issues of balance. A full report is available here. I love the clips of a violent Ogre when they speak about the kids violence! Personally, if the mum is blaming video games for her son's violence, maybe she should take a look at his video collection behind him in one clip. This just seems to be another excuse to cover up bad parenting. You could apply alot of those points to other mediums like DVD boxsets for instance I just brought Smallville seasons 1-9 and watched from episode S1Ep1 to S2Ep16 (37episodes) in a week. As for the world of warcraft anecdote the thing that strikes me is that WoW is a social game, I can imagine the same story about a teenager having a temper tantrum if they are refused permission to meet their friends the only difference in this situation is the digital environment. Why aren't they tackling the idea of addiction in media as a whole, why just games? They're not the root of all evil. I'm actually hoping (in my foolishness) for an enlightened discussion on the issue this time. We all know that game design aims to create "addictions", that is, to give players incentives to return to the game regularly. Be it to keep the players from selling their console games to retailers, or keeping them as paying subscription in the MMO segment. This, however has to be weighed against creating incentives to play 24/7. WoW players will remember the first year after the game's release. To be in the top bracket in either PvE or PvP players you were required to spend every waking hour wiping on raid bosses or farming battlegrounds. In the years since, measures have been put in place to diminish excessive playing, such as limited tries on the hardest bosses. If the industry could communicate this development more clearly it would help against the worst of these "gaming addiction" stories. Really hoping (again, perhaps in foolishness!) that the programme gives a wider view beyond the games industry of other entertainment mediums and factors that can trigger and feed compulsive behaviour. It's probably going to be the usual stake burning through! Poor minority *sniff*. Just make a disclaimer that says, 'You may become addicted to this game if you are susceptible to general addiction or compulsiveness'. Please, please, PLEASE don't let them ruin games for the vast majority. I agree with Craig; 'addiction' in this sense can be levelled at most forms of media. After all, how many people watch TV every night out of habit, or just because it's there? How many people use Facebook every night, looking over updates and photos and friends' profiles? It will be interesting to see how impartial or biased the BBC is in one regard or another. Particularly at a time when they're investing more in gaming than ever before. We'll have an interview with the producer/director of the show going live on the site at 8:30pm GMT tonight. Very much with Kingman on this one, but I'll reserve judgement until I've seen the show. Be interested to see the interview when it goes up. One thing that does concern me is seeing terms like tricks turning up in the blurb for the program and the articles related to it. Tricks does a massive disservice to dev teams whose job is to create something that is fun and entertaining. Games are an entertainment medium, and they're meant to be fun. If someone finds a book hard to put down, or feels that they have to watch every episode of a drama we don't accuse the writers, actors, directors etc. of using "tricks", even though there are recognised techniques for maintaining dramatic tension. Admittedly show's like Panorama will also try and grab your interest by trying to seem edgy and controversial in teasers. Will be interested to see their conclusions. I would watch this ... but I'll be too busy playing World of Warcraft as Cataclysm goes live tonight. This article appears to have been vaped, and the interview appears to have gone live early? Ignorance and missinformation for the shake of audience is far more dangerous than any game. Ignorance in press and media started wars ins the recent past, they should carefully what they say. Many people in the UK "addicted" to terrible soap operas.. shame on you BBC. I'm Going to watch this tonight so i can have a good laugh at what the BBC classes as journalism. Extreme addiction is a possability in any form of entertainment, but looking at the core audience who could be considered to be playing to much. All you need to do is ask them a simple question "do you enjoy your time spent playing the game" as we all know the reply. Utterly appauling piece of "journalism"
to me basically it said "there needs to be more research done into gaming addiction", that pretty much sums it up in one sentence, don't really see the need to get defensive about it. I feel that people need to make sure games are part of a balanced lifestyle. Amazing quote by one of the kids who stated something along the lines of "if you feel you are getting addicted just phone a mate and go out and get utterly smashed" - to me that says, its socially acceptable to go out and get drunk, do damage to your liver and potentially make an idiot of yourself. If we can categorically state that games aren't linked to addiction or showing people where they need to go for advice if they feel like games are taking up too much of their lives then games will finally be socially acceptable? Already commented on the interview, having watched the show if you listen to what's ACTUALLY being said the industry isn't being that defensive, we're just made to sound that way. The arguements are laid out and the conclusion are startling obvious, however the inference that the industry should be taking some kind of responsibility for the, and I quote, "tiny minority" doesn't actually follow. There's a lot of moody shots and dark music and mentions of the silent danger in our homes, while painting addicted gamers as sad, lonely young male slackers, who sit in darkened rooms and live with their parents. I did write out a massive essay but then I read Finlay's comment. I've given up on getting defensive over things, not because "they are right and I'm wrong" but because it goes through one ear and out the other with the people who you are talking too. It is true however, all the programme has said is that "there needs to be more research" that to me just states they will pour a lot of money into something that doesn't need research, which could have gone to a better use like treating cancer, replenishing the consoles from the hospital that was treating kids with cancer or better yet, catching the culprit who stole from them in the first place. To sum it up like Finlay has done...today's society looks at the world in a completely different way to the older generation. Young teenagers find it acceptable to get smashed every week (I was once like them) having a drink is fine but if you have one aim for the night and that is to drink so much that it all comes back up at the end of the night...then yeah.